Shivering and blue-lipped but smiling, Niraj Shukla emerged from the Ganges River this week, flanked by his parents and millions of other people, feeling renewed. "The water is very cold, but once you have a bath – it's sort of a miracle, you know?" said Shukla, a 32-year-old engineer who lives in India's capital New Delhi. The Shukla family were among the first of what's expected to be 150 million pilgrims all taking a dip in India's holy river through March 4 as part of the Kumbh Mela, a Hindu religious festival billed as the world's largest gathering of human beings at one event. It happens every 12 years, its dates fixed according to the alignment of the stars and planets. This year is a half-Kumbh – six years since the last one – but it's nevertheless expected to be the biggest so far. The government officials and religious authorities who organize the event estimate that 15 million people showed up on Tuesday, the opening day. For the 2019 event, some 200 miles of new roads were built to ferry pilgrims from all corners of India. They also come by train, or by boat down the Ganges, carrying their belongings in bundles balanced on their heads. Pilgrims sleep in a vast tent city at the river's edge, where temperatures slide toward freezing at night. Rich and poor, tourists and ascetic monks, all squat side by side, chanting mantras. 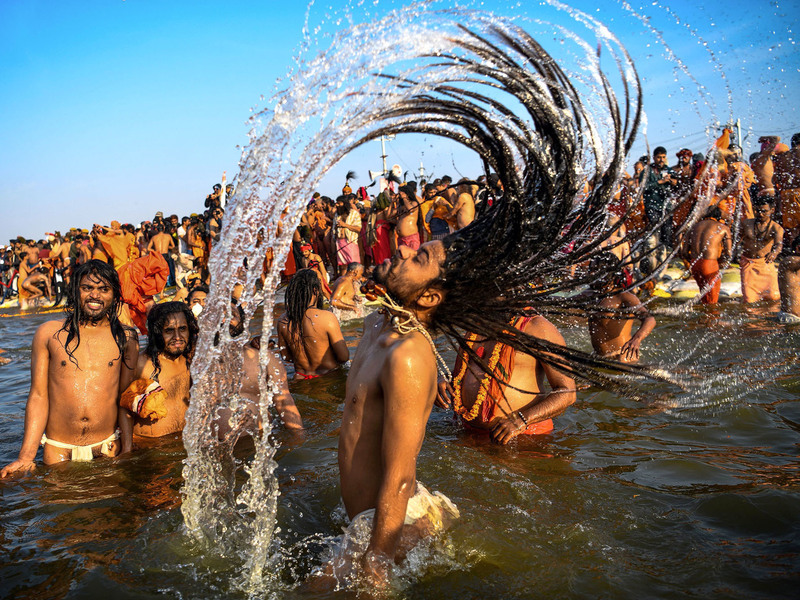 They include naked dreadlocked holy men, Hindu priests draped in orange sarongs and garlands of marigolds, families with infants, foreign backpackers on spiritual journeys – and Shukla and his parents, who hail from the host city, Allahabad. Shukla returns home whenever his hometown hosts the Kumbh. This is his third. The bathing spot is at the confluence of three rivers: the Ganges, the Yamuna – two of India's biggest rivers – and the Saraswati, a mythical river which the faithful believe flows underground. A dip in the waters is said to be restorative, with the power to cleanse sin. "You have work, you have tensions, you've committed some wrongdoings – you know these things deep down inside. Now you come over here, you take a dip, you feel that, 'I am in the company of some holy people – some saints,'" Shukla explains. "And then you step inside this holy water, and you feel inside that you have cleansed yourself." Some people even drink the water, believing it to be curative, though scientists caution them not to. The Ganges and Yamuna rivers are already polluted from industry and sewage. With 120 million people bathing in them over the course of seven weeks, pollution levels spike from all those human beings. It's as if the entire populations of California, Texas, Florida and New York all decided to go swimming in the same spot together. There have been fires and stampedes in past years. But repeat visitors say this year's Kumbh appears orderly so far. Organizers say 30,000 police and security forces are on hand – plus 122,000 portable toilets and 20,000 trash cans. The budget of nearly $600 million – the most expensive Kumbh ever – is split between the state government of Uttar Pradesh and India's central government, both of which are currently governed by Hindu nationalists. Four Indian cities rotate in hosting the Kumbh. They are all said to be located where Hindu lore says the gods accidentally dribbled holy nectar, or elixir, down from the heavens. Kumbh means "pot," a reference to the vessel holding the elixir; Mela means "fair" or "festival." "There was a tussle between the devil and the gods. Some drops of elixir – amrit, we call it in Hindi – dropped at four places in India: Allahabad, Nashik, Ujjain and Haridwar," explains Gitanjali Verma, 28, another local who was attending her first Kumbh. "It was a magical experience," she said after watching the first batch of Hindu holy men dunk in the river at sunrise. "It's just the faith, and the total purity of the heart and mind, which bring people here." The crowd also includes foreign tourists. "I'm an atheist, but because of this it's changing my point of view a little bit," says Spaniard Santiago Merodio, 42, who tacked a trip to the Kumbh onto the end of his India vacation, after attending a yoga retreat. "I'm searching for something [spiritually]." This is the first year the city of Allahabad is hosting the Kumbh under its new name – Prayagraj. Hindu nationalists who govern Uttar Pradesh last year officially renamed the city to refer to an area of land at the confluence of the rivers where Kumbh takes place. The new name carries more significance to India's majority Hindus than the name Allahabad, which had been coined by a Muslim king during the centuries when northern India was ruled by the Mughals. Another new twist to this year's Kumbh: huge billboards of Prime Minister Narendra Modi, who's running for re-election this spring. Many of these pilgrims are part of his Hindu nationalist voter base. "We have to give credit to the ruling party, [Modi's BJP]. The elections are coming. If that means they install more toilets and organize this Kumbh in a more orderly way, that's great," Shukla says. After their dip in the Ganges, he and his parents buy some grain and donate it to a Hindu monk who blesses them, chants a mantra and smears a fragrant paste called tilak on their foreheads as part of a Hindu ritual. "I was shivering and trembling, but the moment I stepped into the water, I was just good," Shukla says. "Now I am going back to my home as a new person."